She's Sew Crafty: I love you, Allison!!! ... for making such adorable things for me! 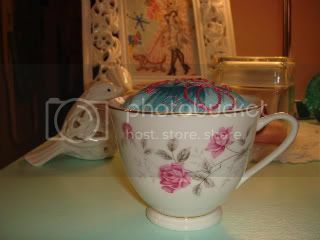 These are the adorable things I received from Alli_Lucy on Craftster in my most recent swap. I am head-over-heels in love with all of it! Really, I can't find enough words to describe how much I love everything. First up is the gorgeous camisole. 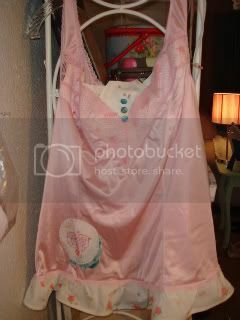 It's actually altered.. it started out as a simple white camisole if you can believe it.. I know it's hard to! Everything on it is so sweet from the embroidery to the fabric-covered buttons! 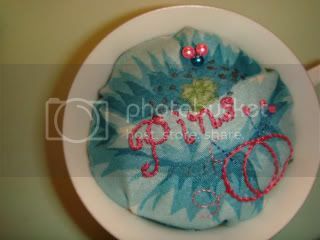 Next is the most adorable little pincushion. I have been wanting one of these for ages! In fact, I just recently printed out a tutorial on how to make one. I'm so happy Alli_Lucy made it for me, though. I don't think mine would have come out half as cute! 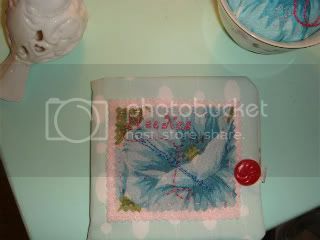 And last but definetly not least is the adorable needlebook. I have been wanting one of these for the longest, too! It's so cute. 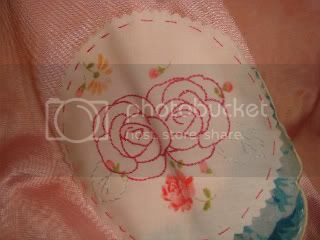 Inside it has roseprint fabric and the needle pages are made out of light and dark pink felt. I can't believe how well made it is! Thank you again, Alli_Lucy! In case you haven't figured it out yet, I really do love it all!